Here at Oaktree Interiors, we are delighted to announce that we have recently been awarded the contract to both design and build the new offices for Tavistock Investment Management at the esteemed Bracknell Beaches location in Berkshire. After a rigorous selection process, and thanks to our professional, optimistic approach, industry-knowledge and can-do attitude, the Tavistock team chose Oaktree as the ideal office interiors company for them. Tavistock Partners â€“ Provides compliance, administration and accounting services to the independent financial advisors, with whom the group as a whole has a close relationship. Tavistock Financial â€“ Provides compliance and oversight services to financial advisors that are both independent and restricted. Tavistock Wealth â€“ Operates discretionary fund management services, which is available to clients of both advisory businesses. Tavistock is committed to delivering a cost-effective and rewarding service to retail investors, and to enforce strong governance and compliancy systems and standards. The new building, erected in the late 1980s, and only recently refurbished by the landlord, offers a blank and flexible space for an office design which is looking to combine both open plan and compartmentation styles. The design brief issued by Tavistock was to create an environment that fully reflected their mission statement of â€œWealth Management". To achieve this practical, albeit luxurious aesthetic, we are introducing full-height veneered doors, frameless double-glazing and various ceiling and lighting features to create an unforgettable and productive atmosphere. We have also made certain that the design itself contains up-to-date Audio Visual systems for effective communication with both staff and clients alike. 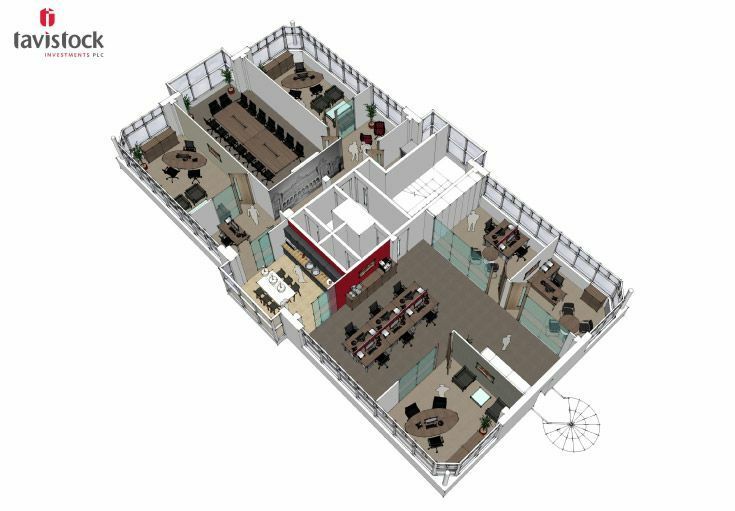 The break-out area design will be completely flexible and will act as a collaborative space for use, not only as a place for a coffee break, but also to accommodate the Hot Desk/Touch Down requirements as well. Tavistock has supreme confidence in our services, over all others, as a means of delivering a high-quality office interior within the given time period. The works are scheduled to take between 6-8 weeks, and will be under way by late August. Here at Oaktree, our dedicated design team are experts when it comes to creating effective workplace environments which fully reflect the business' brand identity. We have built completely bespoke office interiors for businesses of all kinds, and we are particularly adept at making the most of limited office space to create truly unforgettable designs. For more information, get in touch with our team directly on 0118 979 6600 0118 979 6600. If you have any questions, please don't hesitate to can email us at hello@oaktreeoffice.com.